We are students of Tamaki Primary. We work with Mrs Manuyag on different Art projects. Check out our latest masterpieces! What a fantastic surprise to have a brilliant student from Mrs Sharma's class come to show me her artwork! 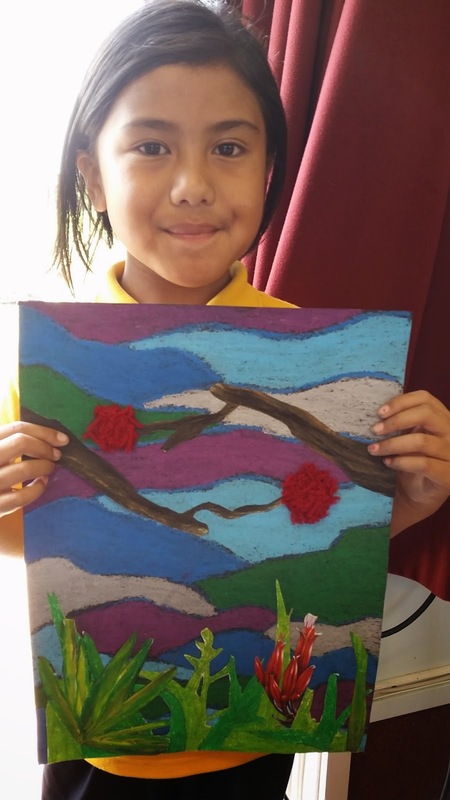 Hope had completed her mixed media art to a high standard within her set time frame. Well done Hope! I really like the colours you used it looks so affective. I love the way how you blended two colours. It looks amazing keep up the great work. Hi hevani,OMG your art is amazing.I like the colours.Great work. Keep it up with your amazing art. that is good and it looks cool. I really like what you have done for art it is really Amazing and creative. The thing I like about it is the color and the drawing because I wouldn't even be able to do that, Well done. Keep up the great work.